Dr. Sanaz Khoubnazar is now offering Zoom whitening at an all-time low price for new patients that would like to reinvent their smile. A smile is one of the most important components of anyone’s appearance. They can exude confidence, help to make lasting first impressions, and are a window into one’s overall health. While effective and pain-free whitening has traditionally been unaffordable for most, one Santa Monica cosmetic dentist, Dr. Sanaz Khoubnazar, is now offering huge specials on one of the most advanced chairside whitening systems in the world, Zoom Whitening. The teeth whitening industry has become exceedingly large and widespread. Many patients have looked towards at-home whitening kits to achieve the smile of their dreams, only to be disappointed. While many of the active ingredients may be similar, none are quite as comfortable, effective, or as quick as the Zoom system. As a seasoned Santa Monica dentist, Dr. Khoubnazar understands how important a patient’s smile is to them, and that is why she is now offering the Zoom whitening system for an all-time low cost of just $179 for new patients. This treatment can often be carried out in a single appointment that lasts less than one hour. In three sessions that last around 15 minutes each, many patients are now noticing that their teeth are as much as 8 shades brighter. On top of this amazing system, the dental office of Dr. Khoubnazar is also offering a full line of cosmetic and general dentistry treatments including porcelains crowns, dental veneers, Invisalign aligners, dental implants, inlays, onlays, and more. Locals that have been looking in the mirror and not seen the smile of their dreams now have access to the leading chairside whitening system at one of the lowest prices to-date. 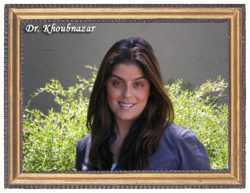 For over 10 years, Dr. Sanaz Khoubnazar has been practicing dentistry throughout West Los Angeles and Santa Monica. After graduating from the Temple University School of Dentistry, she has gone on to specialize in several post-graduate disciplines including cosmetic dentistry, implant dentistry, and full mouth reconstructions. You can call (310) 829-0808 or visit http://www.smilessantamonica.com for more information about this treatment. Dr. Khoubnazar’s office is located at 2915 Santa Monica Blvd. Suite 3 in Santa Monica, CA 90404.